It’s officially dark when I’m heading home from work, and I’m not a fan. For months, I’ve been able to use the evenings to do a workout if I didn’t get it in during my lunch hour, and now I have to really push myself to exercise more. 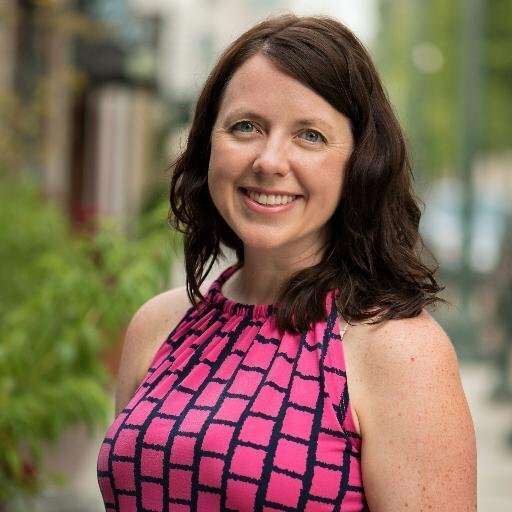 It’s bad enough that I sit down most of the day at my job, I don’t like the increased risk of colon cancer, weight gain and bladder issues that only places like Advanced Urology (https://www.advancedurology.com/) can solve. This is why I really enjoy getting that extra bit of exercise in so I don’t have those risks. But it’s also almost Thanksgiving and then Christmas, so I want to be sure I’m on the healthy side of things as I prepare to eat everything in sight. Regardless of the time of day or the weather, I have several exercises that I can do without visiting the gym. 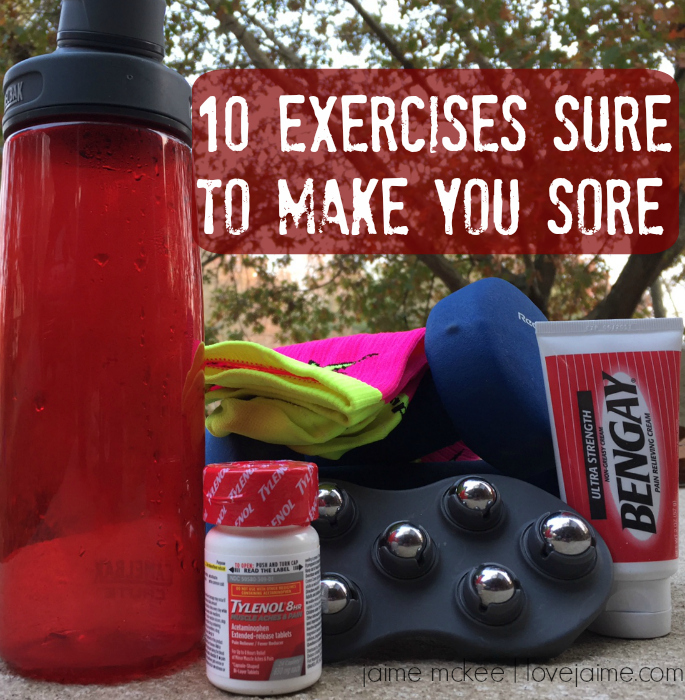 With these exercises, I tend to be more sore and I rely on several things to help me out. Let’s check out my winter wellness kit. 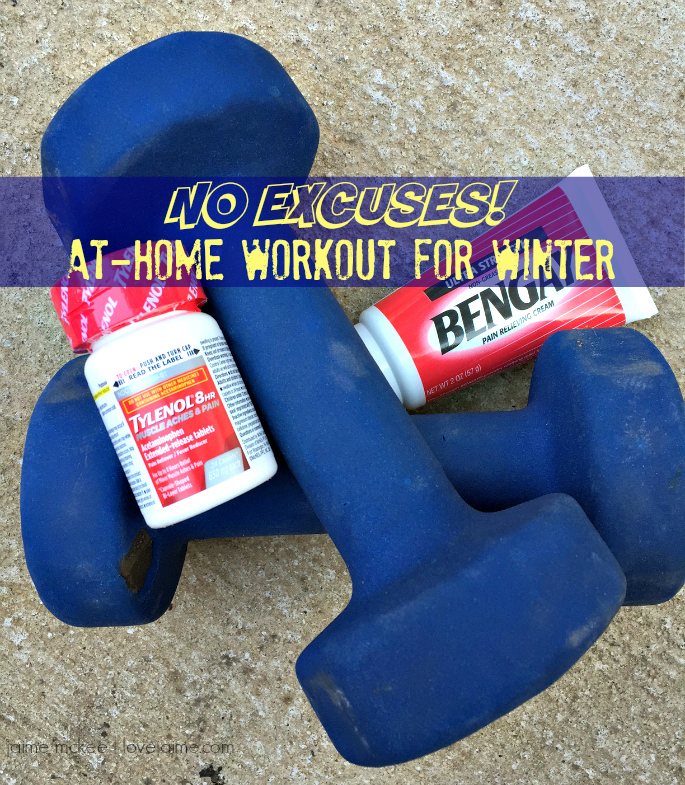 All of the things I like to have on hand to stay pain-free as I exercise during the winter months. Water. Staying hydrated is so important and will help reduce swelling and soreness. I have several water bottles and keep one on hand at all times. I have one in my office, one in my car, one at home and an extra that I carry along in my work bag just in case. It’s a tiny bit excessive. Ultra Strength BENGAY® Cream. I’ll rub this into my shoulders or my legs – especially before I go to sleep. Which then leads me to my next item…. Compression. 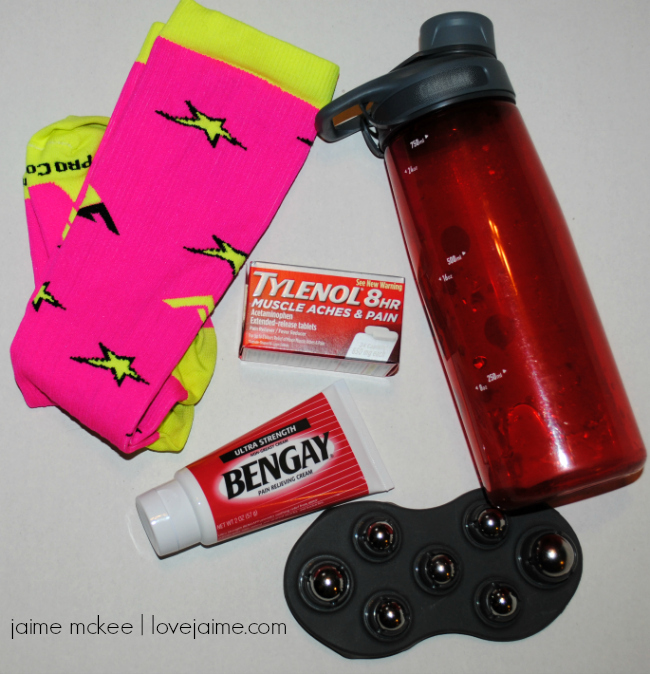 I love compression socks and have just recently tried compression sleeves! If I’m doing a long run, I may wear the socks during my run. 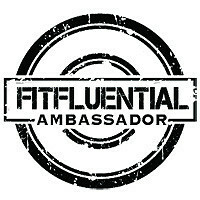 Otherwise, I do compression following a workout to help with sore muscles. Massage. Let’s face it. I can’t afford a massage every week or even once a month. So I have a mini massager that I can use to get knots out of my muscles. 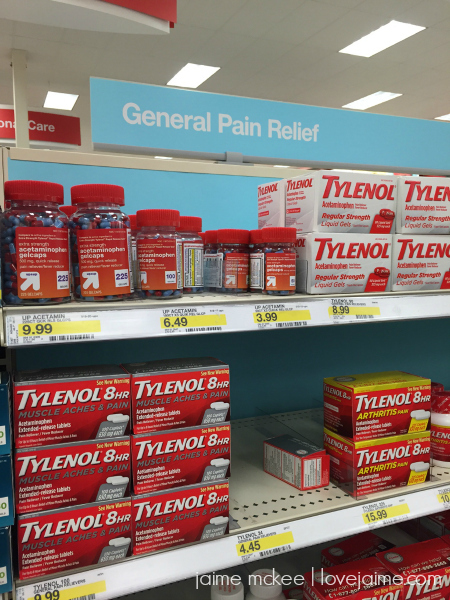 TYLENOL® 8 HR Muscle Aches & Pain. 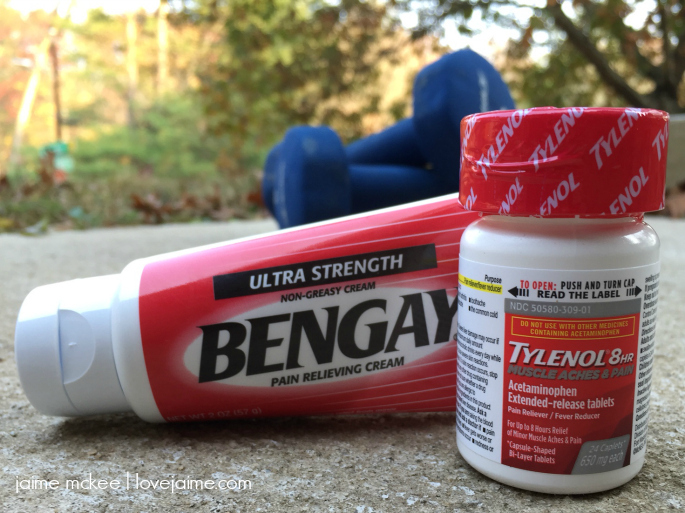 TYLENOL® 8 HR Muscle Aches & Pain is great for muscle aches and backaches. And it works faster than many things when you’re trying to get to the office pain-free in the morning. At home I have a weight bench, which we use less than we really should. I also have dumbbells ranging from 3 pounds to 12 pounds. When I start new exercises, I tend to use lower weights. I currently use 10- and 12-pound weights for most of my workouts. If you don’t have a weight bench in your home, NO problem! 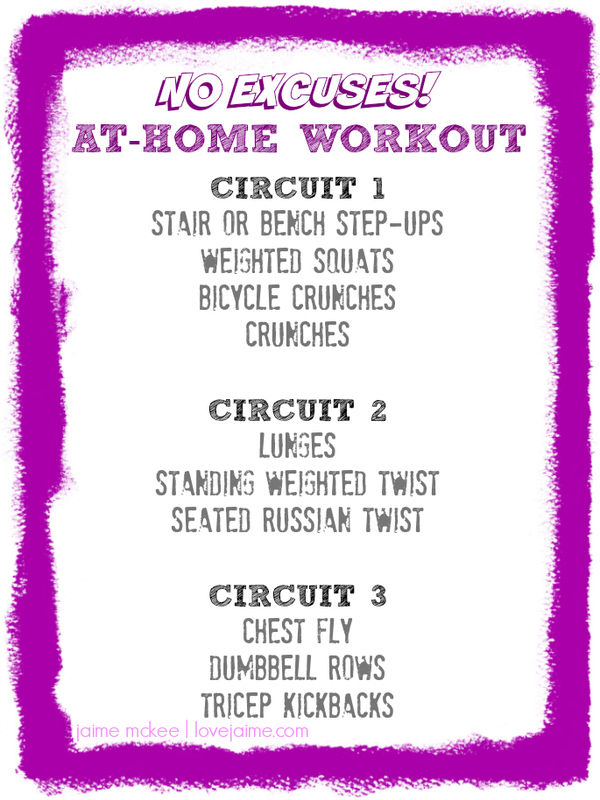 I have 3 circuits of 3-4 exercises each. I do 15-20 reps and do each circuit 3 times. Stair or Bench Step-ups – This is exactly how it sounds. Step up on stairs or a bench. Do this 20 times with each leg as your step off leg (so 20 times each side.) Challenge yourself by holding a weight in each hand. Weighted Squats – Hold a weight in front of you and squat. 15-20 times. Lunges – I will hold 5- or 8-pound weights as I do lunges 20 times each leg. Standing Weighted Twist – I hold a 12-pound weight or medicine ball and twist side to side. 20 times each side. Seated Russian Twist – I haven’t worked my way to holding a weight with this one, but one day soon I will! 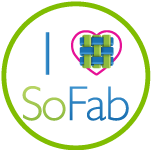 I’ve been exercising fairly regularly since June, and I still get sore after these exercises. I also do these exercises about 2-3 times each week. I aim for cardio the other days. The beauty of these exercises is they truly can be done at home or in a gym. You don’t need a membership or expensive equipment to do them. What’s your favorite no-gym-needed exercise or workout?